Milwaukee<sup></sup> M12 Camo Heated Hand Warmer: Designed for the outdoorsman, the Milwaukee<sup></sup> M12 Cordless Realtree Xtra<sup></sup> Camo Hand Warmer integrates carbon fibre heating elements between a durable wind and water resistant exterior and thermal fleece liner to heat your hands and help maintain dexterity. Insulating dual-cuff construction forms a wind-proof seal in combination with your outer layer to keep the weather out, even on the coldest days. Featuring special noise-reducing fabric and the Realtree Xtra<sup></sup> Camo pattern, the hand warmer provides up to 6 hours of continuous heat per battery charge reducing the need for bulky gloves while blending in with the natural colours of the fall, winter and early spring. Adjustable heat zones provide the right amount of heat for any situation. Utilizing the same M12 REDLITHIUM Battery technology that powers 60+ tools, the M12 Battery holder is stored in a sleek back pocket. All M12 Heated Hand Warmers are washer and dryer safe. One size fits most. This absorbent terry cloth mealtime protector with a water-resistant backing will shield clothing from food or drink stains. It's long enough to cover the chest area as well as the lap to catch any spills or crumbs. The hook and loop closure makes it easy to close without worrying about buttons or snaps. It's easy to keep clean because it's machine washable. This pretty waterproof mealtime protector will shield clothing from food or drink stains. It's long enough to cover the chest area as well as the lap to catch any spills or crumbs. The hook and loop closure makes it easy to close without worrying about buttons or snaps. It's easy to wipe clean or throw in the wash. The wrinkle-resistant poly-cotton material means it comes out looking great. The colour Trim Large umbrella is great for staying dry in rainy weather. The vented canopy design is engineered to resist wind conditions. The ergonomic rubber grip handle with wrist strap enables a comfortable feel. The Color Trim Small umbrella is great for staying dry in rainy weather. The 3 fold structure provides the ability to fit in most bags. The auto open features helps to open the umbrella for quick coverage from rain. M12 Cordless Realtree Xtra Heated Hand Warmer Only Milwaukee<sup></sup> M12 Camo Heated Hand Warmer: Designed for the outdoorsman, the Milwaukee<sup></sup> M12 Cordless Realtree Xtra<sup></sup> Camo Hand Warmer integrates carbon fibre heating elements between a durable wind and water resistant exterior and thermal fleece liner to heat your hands and help maintain dexterity. Insulating dual-cuff construction forms a wind-proof seal in combination with your outer layer to keep the weather out, even on the coldest days. 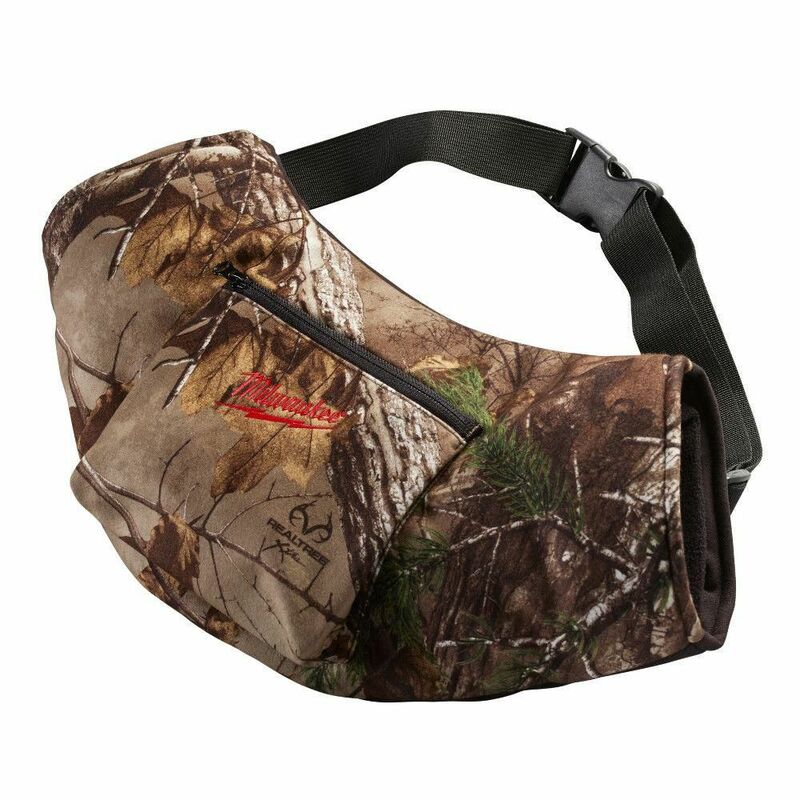 Featuring special noise-reducing fabric and the Realtree Xtra<sup></sup> Camo pattern, the hand warmer provides up to 6 hours of continuous heat per battery charge reducing the need for bulky gloves while blending in with the natural colours of the fall, winter and early spring. Adjustable heat zones provide the right amount of heat for any situation. Utilizing the same M12 REDLITHIUM Battery technology that powers 60+ tools, the M12 Battery holder is stored in a sleek back pocket. All M12 Heated Hand Warmers are washer and dryer safe. One size fits most. M12 Cordless Realtree Xtra Heated Hand Warmer Only is rated 3.8 out of 5 by 24. Rated 3 out of 5 by Dmo from I own the hoodie and was happy with it, however,... I own the hoodie and was happy with it, however, I was not that impressed with the hand warmer.. was hoping for more but seems they should have but more heating element inside. Battery didn’t seem to last long on high either. Probably good for gaming event, not ice fishing! Rated 1 out of 5 by Rooster from Doesn't put off a noticable amount of heat. I really hope Milwaukee redesigns this with a higher ... Doesn't put off a noticable amount of heat. I really hope Milwaukee redesigns this with a higher out put. The muff seemed to have good constructions, just fails to preform.